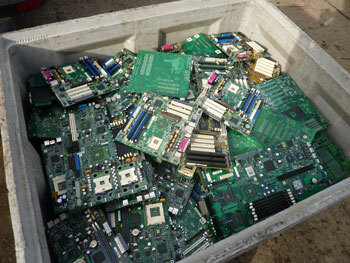 Why recycle your old IT and Comms Equipment? An estimated 50 million tons of e-waste are produced each year* – much of which is considered to be hazardous because of the toxic materials used to create complex electronics. Rather than dump these in landfill, many of the materials, including the hard to dispose of metals, can be recovered for future use. This not only protects the environment by decreasing the amount of hazardous waste, but reduces the amount of greenhouse gas emissions caused by the manufacturing of new products. *Sthiannopkao S, Wong MH. (2012) Handling e-waste in developed and developing countries: Initiatives, practices, and consequences. Sci Total Environ. a trend with a variety of benefits for business owners. Whether its legislation or conscience that pushes us to be more environmentally aware in the workplace, there can be no doubt that applying greener processes sets a better example for both employees and customers. An average computer has over a hundred toxins in it. These include highly toxic substances such as lead, cadmium and arsenic, so what happens to the computer/electrical waste when it’s time for disposal? Computer wires, if openly burned, release hydrocarbon ashes into air, water and soil. Dumping items such as these in landfill increases the risk of toxins seeping into the soil and the water table, resulting ultimately in an environmental hazard for us all. Of course the immediate effect of disposing of old equipment that is piling up gathering dust is that the office feels fresher, more spacious, and a generally nicer place to work. When it comes to disposing of e-waste, there is no argument. Government legislation such as the Waste Electrical and Electronic Equipment Directive (WEEE) insists that we must get rid of electronic waste responsibly. The decision for you is how to do it. So why not let us help?